Today I am hopping a plane and headed for Paris. It still hasn’t sunk in some how, but I know after our 20 hours of travel the next day and a half and we land in Paris that I will feel some major sense that it is real. While I am traveling I am working alongside some other bloggers who are giving me some of their essentials, tips, and everything between for travel to give a peak in to their travel life. Jenn is a dear friend and I value her taste and talents so much and was excited to begin this with some of her favorite essentials as this lady has been traipsing all through Europe for much if this year. So I feel if we should take the essentials from anyone, it should be her! 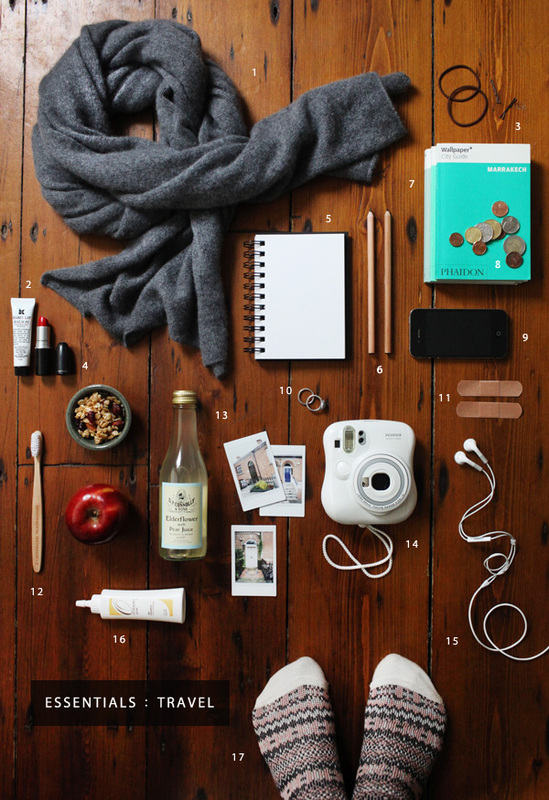 See what Jenn says about her essentials. As a frequent traveler, packing can become quite the nuisance when it happens on a regular basis. You begin to realize there are a select few “essentials” which when brought along on any adventure will ensure you feel the comforts of home, are well prepared for anything that comes your way, and aren’t ever carrying too heavy of a load. 1. Cashmere Scarf. 2. Lip Balm. 3. Hair Management Tools. 4. Red Lip Stick. 5. Notepad. 6. Writing Utensils. 7. Travel Guides. 8. Local Currency. 9. iPhone. 10. A Cherished Possession. 11. Band-aids. 12. Toothbrush. 13. Snacks. 14. Camera. 15. Headphones. 16. Dry Shampoo. 17. Cozy Socks. Also make sure to follow my travels on x…it should be lots of fun!! Have a wonderful trip! I can’t even describe how jealous I am. I love these travel essentials. I always bring a large scarf on the plane that can double as a blanket. wallpaper city guides are the best. have a great travel. Love how you styled this post! Where did you get that camera? Is it a Polaroid?? That would be awesome. My friend Jenn styled it, but the camera is from instax from Fuji. It is an essential travel item for sure and a super cheap thing for your trip as i just bought one with 40 exposures and the camera for $100 on Amazon. I suggest checking it out!